There are already many netbook designs in the market but you may be surprised to figure out that it is not common to include optical drive in the portable and lightweight machine. If you are hoping to get one with the internal optical drive module, now the piece of news from Asustek may cheer you up. Asustek has just confirmed that the upcoming design will be bundled with optical drive on top of those standard features available in netbook market. 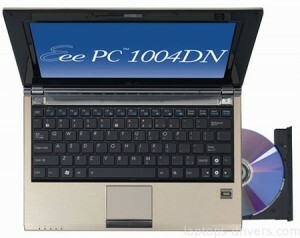 The upcoming netbook, codenamed as PC 1004DN will be powered by Intel N280 processor clocking at 1.66GHz. While the 3.5-inch optical drive module seems to be relatively large that may take up some space in the system design, the Asustek designer has able to fit everything in a 10.9 X 7.55 X 1.33 inches dimension and at around 3.19 pounds (include battery). It is also equipped with a standard 10-inch 1024 X 600 resolution display, internal storage of 120GB PATA hard disk drive as well as 2GB SoDIMM memory module. Another new change that being initiated on this netbook design is the use of companion chipset, GN40 as a new chipset replacement for its previous 945GSE solution. The new chipset is claimed to be able to handle 720p HD (High Definition) resolution media playback for greater visual experience as a multimedia centric device. No information on pricing and availability yet, the upcoming netbook could potentially run by either Windows or Linux Operating Systems.